Annotations are small, clickable notes you can stick on your model. They are useful for adding information to a specific section. Each annotation has a position, a camera position, a title (required), and a description (optional). Annotations are ordered in a numerical list. From your model page, click 3D Settings or add "/edit" to the end of any model URL. Select the Annotations panel in the top left. Navigate to the Annotations tab in 3D Settings and double-click somewhere on your model. A circled number will appear below the cursor with a text bubble next to it and the annotation appears in the list on the left-hand side of the screen. Enter a title (required) and a description (optional). You can add links, images, and other formatting, if you'd like, using Markdown. Click anywhere outside the annotation to close it. Repeat these steps for each annotation and click Save Settings in the top-right corner to save them. Titles are limited to 64 characters. Descriptions are limited to 1024 characters. Annotations are not compatible with Camera Limits. Annotations can only live on the surface of the model - they cannot float in space. As a result, point clouds cannot be annotated. Users with a free Basic account can create up to 5 annotations per model. Users with a PRO account can create up to 20 annotations per model. Users with a Premium account can create up to 50 annotations per model. Users with a Business account can create up to 75 annotations per model. Users with a Enterprise account can create up to 100 annotations per model. See also: Annotations - Pro Tips. To delete an annotation, click the trash can icon of an annotation in the Annotations tab on the left hand side of the 3D Settings screen. Click the annotation in the model view and type your changes in the text bubble. Double-click the annotation or click Edit in the list on the left hand side. Type your changes in the fields. Click Done or click outside the annotation to confirm your changes. To move an annotation, drag and drop it to a new position. If the annotation is dragged to a place where it cannot be dropped, it turns red. Set a new camera position. Click on the camera icon for the annotation in the list on the left hand side. The thumbnail updates to show the new camera position. To reorder annotations, drag and drop annotations by their header, up or down in the list. When a model has annotations, new buttons are available in the viewer. When annotations are off, "next" and "previous" buttons still work and move the camera. Plus, when annotations are off, hovering over the annotation menu button will reveal the annotations. You can also use the J and K keys to navigate through annotations. 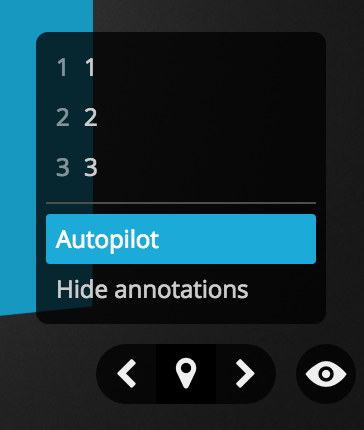 Autopilot mode will move through annotations at a default speed. There are also several ways to manipulate annotations with embed parameters. Why is not possible the make a reference for another modell on sketchfab in the annotations? It will be a very usefull - killer feature - for presentation of huge modells! I'm Having language errors there. Polish font's are being badly displayed? Is there any way around it? @spigolo - yes, adding rich media features inside annotations is on our to-do list. For now you could build something on top of the viewer using the Viewer API. @moritzw - Nice, thanks for the link and feedback. For WIP projects or showing clients privately, you can make the whole model Private? Point cloud is not possible to use annotations? @mark.energy - Not at the moment! One solution is to manually add some meshed geometry to your model, place annotations on it, then make the mesh 100% transparent. @moritzw - Ah I see, thanks for clarifying. https://matter.io/ has an interesting solution to this (and is currently working to improve it), by embedding the whole annotation editor in their site for customers to use. Is it possible to upload a 3D model, annotate it, and then "click" on the annotations in Google Cardboard so they display when you want them to? @dcurran - Not at the moment. Annotations + VR mode is something we hope to improve in the future. Maybe you could activate "Autopilot" to automatically cycle through the Annotations? @James - Thanks for the response. Can you activate "AutoPilot" while in a viewer to turn it on and off? I imagine you would you have to activate it before setting it inside of Cardboard and then take your phone out to stop it? Also one more question, I see that AutoPilot is a default timing but can you change the default time? @dcurran - Yes you can, and yes you are correct about starting and stopping it outside the Cardboard, at least for now. Hey, Is it possible to create or edit annotations? Could not find anything in the API documentation. If there is could I please get the link or some information about it? @melledijkstra - It's not possible with the API yet, but it's something we hope to implement in the future. Hey, when I update the position of an annotation's camera, how long it takes until it takes effect? I have a scene with 20 annotations (max amount for my currrent profile), I change annotations' camera/view, click "Use current point of view" then save settings. But when I exit editing and go back to the model, the annotations still have the old point of view. What am I doing wrong? Hi @urbanid3d - Sorry for the delay! Are you still having trouble? Could you send me a link to the model? Thanks! @urbanid3d - Thanks. I went in and changed some annotation views and it worked fine. Are you sure you clicked Save Settings after setting the new cameras? @Mknight13 - When you downgrade, all your existing content will be preserved, but you won't be able to make any edits to 3D settings - it will show an error that you have too many annotations for your plan. @archeotech Good catch, we'll get that fixed ASAP! Is it possible to show annotations in AR mode using the app?? ?